The Taxpayer Advocate Service (TAS) is an organization within the Internal Revenue Service that is designed to help taxpayers resolve problems with the IRS. The TAS was first formed in 1978. Over time, it gained more responsibilities and authority, primarily as the result of the IRS Restructuring and Reform Act of 1998 and the passage of the Taxpayer Bill of Rights. The TAS website is http://www.taxpayeradvocate.irs.gov. The TAS’s primary duties are to resolve taxpayers‘ problems with the IRS, identify problem areas in IRS services, and propose changes to mitigate those problems. The TAS provides an annual report to Congress about the quality of IRS services. In general, taxpayers may be eligible for assistance if they experience economic harm or significant cost (including fees for professional representation), a delay of more than 30 days to resolve their tax issue or no response or resolution to a problem by a date promised by the IRS. The Taxpayer Advocate Service is a free service intended to meet the tax needs of businesses and individuals. There is a taxpayer advocate in every state, as well as Washington, D.C., and Puerto Rico. 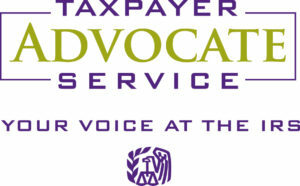 The Taxpayer Advocate Service (TAS) is an independent organization within the IRS and is your voice at the IRS. We help taxpayers whose problems are causing financial difficulty. This includes businesses as well as individuals. You may be eligible for our help if you’ve tried to resolve your tax problem through normal IRS channels and have gotten nowhere, or you believe an IRS procedure just isn’t working as it should. The Right to a Fair and Just Tax System.Our TAS Tax Toolkit at TaxpayerAdvocate.irs.gov can help you understand these rights and what they mean for you. The toolkit also has examples that show how the Taxpayer Bill of Rights can apply in specific situations. If you qualify for our help, you’ll be assigned to one advocate who will be with you at every turn.And our service is always free. They have at least one local taxpayer advocate office in every state, the District of Columbia, and Puerto Rico. You can call your advocate, whose number is in your local directory, in Pub. 1546, Taxpayer Advocate Service — Your Voice at the IRS, and on our website at irs.gov/advocate. You can also call them toll-free at 877-777-4778. The TAS Tax Toolkit at TaxpayerAdvocate.irs.gov has basic tax information, details about tax credits (for individuals and businesses), and much more. TAS also handles large-scale or systemic problems that affect many taxpayers. If you know of one of these broad issues, please report it to us at http://www.irs.gov/sams. TAS is here to help you because when you’re dealing with a tax problem, the worst thing you can do is to do nothing at all.